Buy Suma Organic Popcorn - 500g in the UK from our online shop or directly from our independent Scottish store. This organic popcorn is non GMO, organic, unsweetened, unsalted and not genetically modified. Serve sweetened or salted as a snack, or can be used as a grain with meals. Nothing artificial, no genetically modified maize or corn! As official Suma stockist, we sell genuine Savoury Snacks directly from our shop in Scotland and online throughout the UK. Where can you buy real Organic Popcorn safely online? If you are wondering where you can buy Suma Organic Popcorn - 500g safely online in the UK, then shop with us. We are an actual health foods shop; with real people selling real foods and products. Our award-winning independent shop is located in Stirling, Scotland since 1976. You can buy our Beans, pulses, grains, flours, seeds and dried fruit and other genuine Savoury Snacks in store or safely place an order with us online or over the phone. 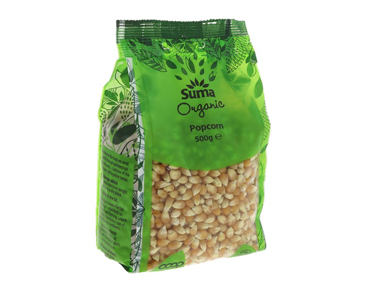 Organic Popcorn - Suma Organic Popcorn - 500g in Savoury Snacks and Foods.